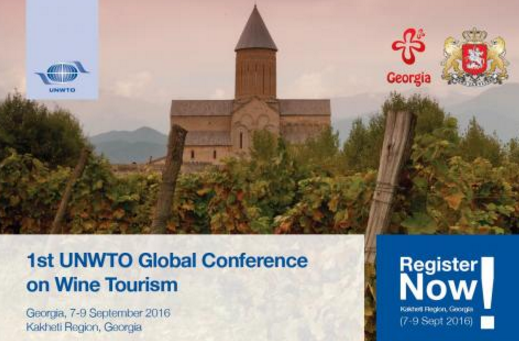 “Georgia’s unique wine-making traditions date back 8,000 years and are part of UNESCO’s intangible heritage, creating the ideal base to host the Wine Tourism Conference. Herewith, the country’s recent success in attracting a growing number of tourists, its development in terms of tourism products, branding and marketing present an excellent platform to share best practices, experience and knowledge", - said Dimitry Kumsishvili, Minister of Economy and Sustainable Development of Georgia. Located in the picturesque slopes of the Caucasus Mountains in Kakheti, the Alaverdi monastery is home to a spectacular 55 metres high Cathedral. The history of the monastery dates back to the VI century and a former preferred place of worship for Georgian kings. The monastery is home to an ancient VIII century cellar boasting an intriguing collection of about 50 original, preserved “qvevris” (traditional Georgian wine vessels). It has managed to maintain throughout the generations, the ancient Georgian “qvevri” wine-making technique, nowadays and a trademark wine-making method of the Kakheti region. - The UNWTO Wine Tourism Prototype will be presented by UNWTO and Affiliate Member, the Leading Brands of Spain Forum along with its five participating wineries: Osborne, Gonzalez Byass, Barbadillo, Freixenet and Pagos del Rey. The Affiliate Members Programme of the World Tourism Organization (UNWTO), together with Affiliate Member Foro de Marcas Renombradas Españolas (Leading Brands of Spain Forum, FMRE), is developing a tourism prototype that aims at providing a new innovative way to promote and showcase Spain and its lifestyle through the member wineries of FMRE. The participating wineries will become visitor centres offering travellers different and authentic insights into the rich history and most important resources of their respective regions. This project is a fresh approach for meeting the demands of emerging consumer profiles and contributes to Spain’s repositioning as a destination by providing valuable additions to the country’s product offerings. The UNWTO has carried out the necessary fieldwork with the collaboration of wineries in the following regions: Cádiz (Jerez, Puerto de Santamaría and Sanlúcar de Barrameda), Galicia, Penedés, Priorat, Ribera Del Duero, Somontano, Toledo and Toro. The UNWTO has also developed the prototype’s technical design, brand image, product development, communications plan and governance model for its management. This project can be developed and applied internationally in any other destination that meets the standards set in the prototype.